Now for some more signs from Florence - these all come from churches or museums. Ascending to the dome of the Duomo. I like the graffiti "conversations" that have ensued around this sign. 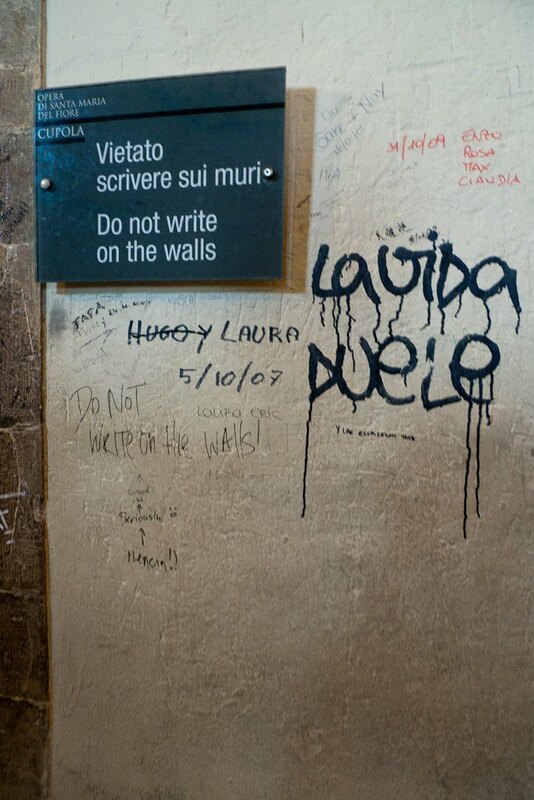 Note someone has crossed out the name HUGO from the Spanish "Hugo y [and] Laura" and replaced it with LAURA ERIC underneath. 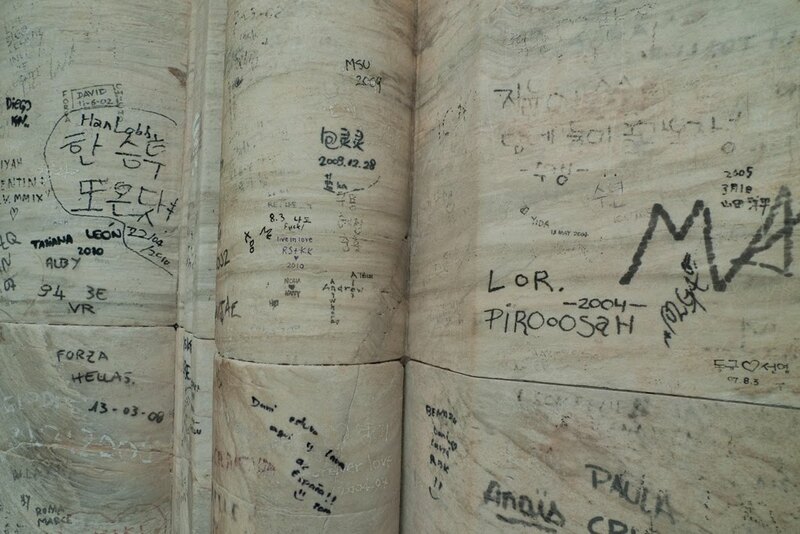 Some writing on the top of the dome of the Duomo. For some reason a lot of Korean and Chinese inscriptions. Nice little acrostic involving the names Alex and Andrew (center). Writing on walls is, of course, an old practice. 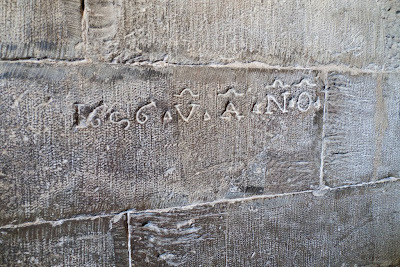 Here's a 17th century inscription on the way down. Ten Commandments motif on the doors exiting the Duomo. 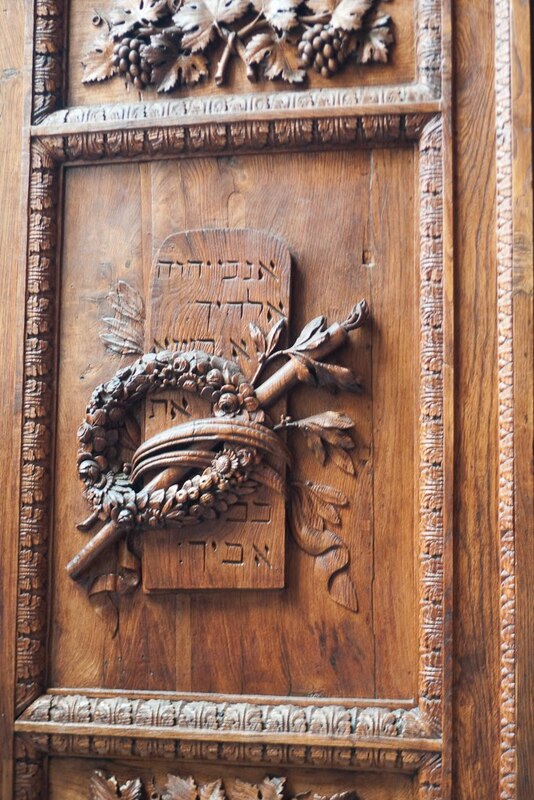 You can just make out (most of) the Hebrew text of the first 5 commandments. 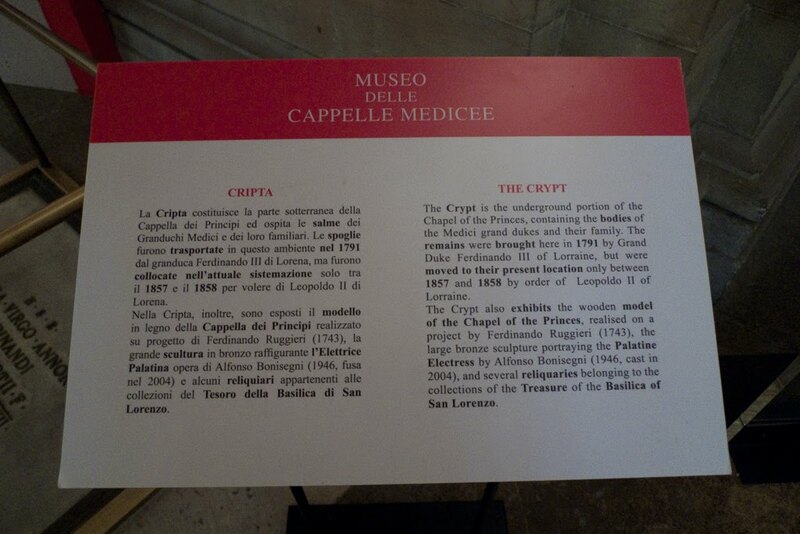 The translations inside the crypt of the Medici Chapel are mostly unremarkable - but it did strike me as odd how certain words were in bold. I suppose if you were in a hurry or something this could help you scan the text more efficiently. Lastly, an idiosyncratic sign in the garden of the Franciscan monastery in Fiesole. 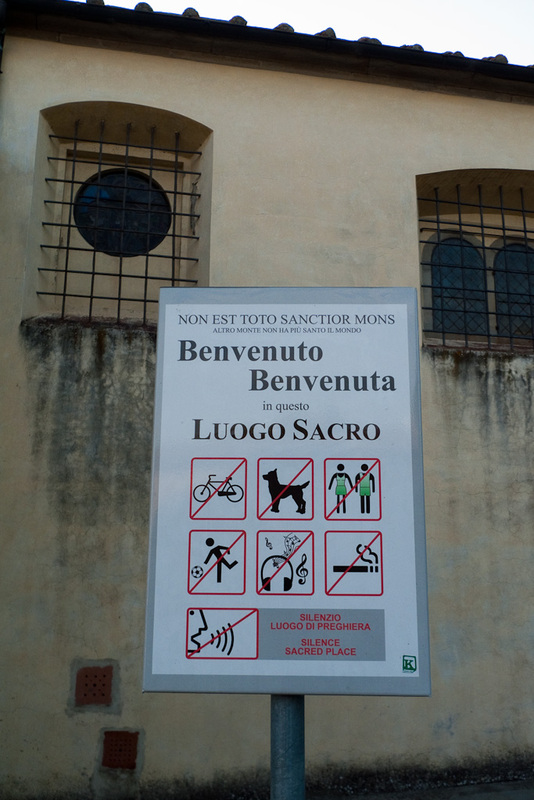 The Latin NON EST TOTO SANCTIOR MONS (and Italian equivalent, underneath) mean "in the whole world there is no mountain more holy"). Curiously, the word "welcome" (benvenuto / benvenuta) is grammatically inflected in both its masculine and feminine forms (welcoming the male and female reader equally?). The icons for all the forbidden activities are cute. 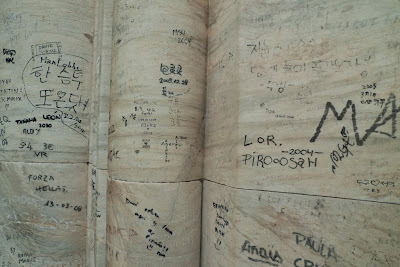 What kind of script is used for the 17th-century inscription (in the 3rd photo)? I don't think I recognize it. As far as I can tell it is Roman font, just in the form of 17th century capital letters. 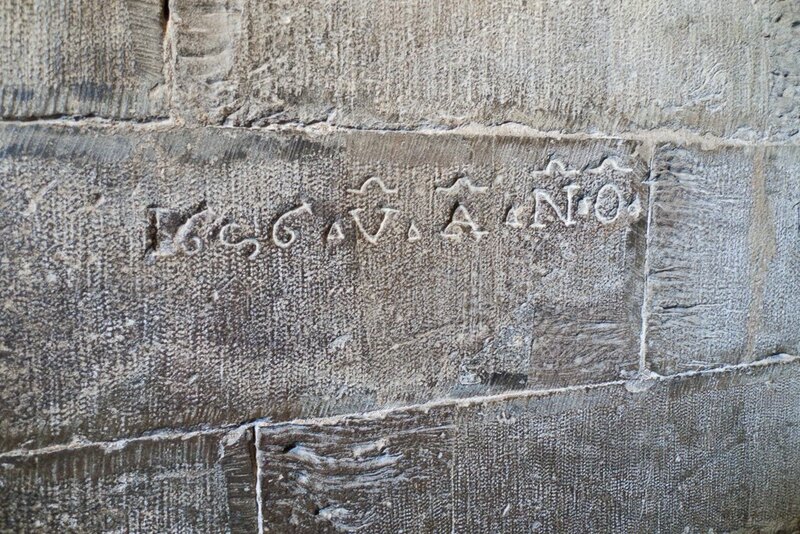 The year 1656 looks like "I6S6" and the other letters are V.A.N.O. I'm guessing the "omega"(Ω) symbol above each letter indicates this is an abbreviation or acronym? But I don't know what it means. Whoops, make that "script" instead of "font." Just goes to show how much computers have shaped the way I think about text.